Applies tabs to 3 sides in a single pass to meet the USPS specifications for self mailers and booklet tabbing regulations. 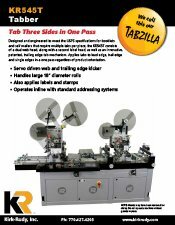 The KR545T mailing tabber tabs lead-edge, trail-edge and side edges all in a single pass. It handles large 18″ diameter rolls and runs all major types of tabs as well as pressure sensitive stamps and labels of various shapes and sizes. Multiple tabs or labels can be applied in a single pass. The KR545T runs in-line with most standard addressing and binding systems and its triple-web design is ideal for use behind a Stitcher/Trimmer. Use it with the KR565 splice unit for uninterrupted continuous tabbing and labeling.